It’s been a busy day for Olympus announcements. Hot on the heels of the Olympus E-M1X, along with the M.Zuiko 150-400mm f/4.5 lens and MC-20 teleconverter, the company revealed the FL-700WR weatherproof flash and commander/receiver units. Complementing the weatherproof properties of the new camera and lens, the Electronic Flash FL-700WR is dust, splash and freezeproof, making it suited to shooting in virtually every environment – even when it’s raining. It packs a good punch, with its maximum guide number of 42 (ISO 100/m) being a cut above the 36 offered by the Olympus FL-600R, and during wireless shooting it can act as commander or receiver. 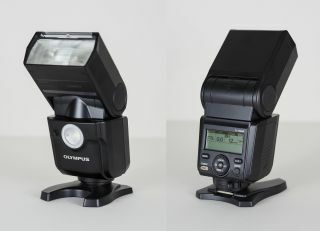 As you'd expect, the FL-700WR supports Olympus' signature functions such as High Res Shot, Focus Stacking and Focus Bracketing, and also boasts an LED light that's ideal for video use. Accompanying the new flash are the Wireless Commander FC-WR and Wireless Receiver FR-WR, capable of remotely controlling multiple flash units up to 30m from the camera; the Commander can connect to three groups and an unlimited number of units. As with the FL-700WR, both the Commander and Receiver are dust, splash and freezeproof to facilitate use whatever the prevailing conditions. Which, with the weather we've had lately, should come in extra useful. The Olympus OM-D E-M1, E-M1 Mark II, E-M5 Mark II and PEN-F have all received firmware updates to add support for the FC-WR commander. Due for release alongside the E-M1X in late February, the FL-700WR flash will retail for EUR 349, with the Commander FC-WR and Receiver FR-WR retailing at EUR 299 and EUR 199 respectively.